"My mom has made this dressing forever. 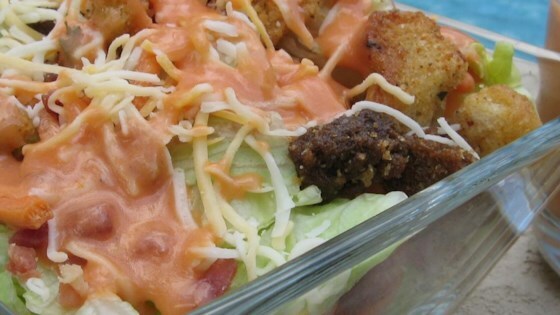 It's been a family favorite right next to homemade ranch dressing." Combine the ketchup, vegetable oil, mayonnaise, vinegar, sugar, onion, salt, and pepper in a blender; blend until smooth. Store in refrigerator. It’s the classic green salad dressing starring tarragon and parsley. I used EVOO, only had miracle whip and only used a tablespoon of sugar. The dressing turned very good and is a keeper. yum! I used EVOO instead of vegetable oil. I would def. make this again. Cost effective, tasty, and no preservatives or funny sounding additives. Thanks! I also slightly reduced the sugar and replaced part of it with honey, 1T honey and 2 T sugar for half a batch. Replace a fourth of the vinegar with apple cider vinegar for extra tang! i made this recipe a couple weeks ago... you posted it on the recipe exchange. it was delsih!!! Love, love, love this dressing. Great on salads, vegetable platters, toes, fingers, whatever! I keep it in the fridge at all times.